This article is about the genre of music. For wrestler formerly known as Rockabilly, see Monty Sopp. For the 1957 popular song, see Rock-a-Billy (song). 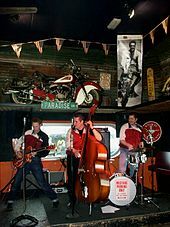 2 Use of the term "rockabilly"
"Love My Baby" (1953) by Memphis electric blues band Little Junior's Blue Flames, featuring Pat Hare on the guitar, is considered an important contribution to the rockabilly genre. Zeb Turner's February 1953 recording of "Jersey Rock" with its mix of musical styles, lyrics about music and dancing, and guitar solo,  is another example of the mixing of musical genres in the first half of the 1950s. The trio released " Train Kept A-Rollin'" in 1956, listed by Rolling Stone magazine as one of the top 500 rock songs of all time, having been covered by the Yardbirds, Aerosmith, and many others. Many consider this 1956 recording to be the first intentional use of a distortion guitar on a rock song, which was played by lead guitarist Paul Burlison. Many rockabilly guitarists and historians now accept that on many of the classic recordings Johnny Burnette did in Nashville for Decca it was the legendary "A Team" of Grady Martin on guitar, Bob Moore on bass and Buddy Harmann on drums   backing Johnny and Dorsey on vocals (the author of this comment has had discussions with Bob Moore where he confirms this). In all likelihood both Paul Burlison and Grady Martin played on some of the Nashville recordings, with who played what lost in the mists of time. The recordings done in the Pythian Temple in New York are undoubtedly all the work of Paul Burlison. Elvis Presley's " That's All Right" (1954), an early rockabilly song. It was a cover of Arthur Crudup's 1947 blues song of the same name. Presley's first recording, a blues song titled " That's All Right Mama", was previously recorded in 1946 by Arthur Crudup. 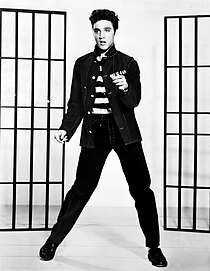 In this recording Presley married "black" and "white" genres to an extent that it was denied airplay on (white) country radio stations and (black) R&B stations, dismissed for being defined as both "black" and "white" music. Record Producer Sam Phillips was told by country deejays that Presley's "That's Alright Mama" was "black music" and lamented they would be "run out of town" for playing it. Similarly, R&B deejays categorized it as a (white) country song. When the song was finally played by one rogue deejay, Dewey Phillips,  Presley's recording created so much excitement it was described as having waged war on segregated radio stations. "The Sun recordings were the first salvos in an undeclared war on segregated radio stations nationwide." Some have claimed that the sound of "That's Alright" was not entirely new, "It wasn't that they said 'I never heard anything like it before.' It wasn't as if this started a revolution, it galvanized a revolution. Not because Elvis had expressed something new, but he expressed something they had all been trying to express." Sam Phillips indicated that for him it was a new sound, saying "It just broke me up". And many echo the sentiment that it was a sound like no other they had heard: "When I first heard Elvis singing 'That's Alright Mama'. The time just stood still. It knocked my socks off." -- Ramon Maupin. Bill Haley and His Comets' " Rock Around the Clock" (1954) is credited with popularizing rockabilly music. In August Sun released Elvis's versions of " I Forgot to Remember to Forget" and " Mystery Train". "Forgot ...", written by Sun country artists Stan Kesler and Charlie Feathers, spent a total of 39 weeks on the Billboard Country Chart, with five of those weeks at the number one spot. "Mystery Train", with writing credits for both Herman Little Junior Parker and Sam Phillips, peaked at number 11. Sun and RCA weren't the only record companies releasing rockabilly music. In March Columbia released " Honky Tonk Man" by Johnny Horton,  King put out "Seven Nights to Rock" by Moon Mullican, Mercury issued "Rockin' Daddy" by Eddie Bond,  and Starday released Bill Mack's "Fat Woman". Carl Perkins, meanwhile, was involved in a major automobile accident on his way to appear on national television. Gene Vincent and His Blue Caps' recording of " Be-Bop-A-Lula" was released on June 2, 1956, backed by "Woman Love." Within twenty-one days it sold over two hundred thousand records, stayed at the top of national pop and country charts for twenty weeks, and sold more than a million copies. These same musicians would have two more releases in 1956, followed by another in January 1957. There were thousands of musicians who recorded songs in the rockabilly style. An online database lists 262 musicians with names beginning with "A". And many record companies released rockabilly records. Some enjoyed major chart success and were important influences on future rock musicians. In the summer of 1958 Eddie Cochran had a chart-topping hit with " Summertime Blues". Cochran's brief career included only a few more hits, such as "Sitting in the Balcony" released in early 1957, " C'mon Everybody" released in October 1958, and " Somethin' Else" released in July 1959. Then in April 1960, while touring with Gene Vincent in the UK, their taxi crashed into a concrete lamp post, killing Eddie at the young age of 21. The grim coincidence in this all was that his posthumous UK number-one hit was called " Three Steps to Heaven". The first record to contain the word "rockabilly" in a song title was issued in November 1956 "Rock a Billy Gal",  although Johnny and Dorsey Burnette recorded "Rock Billy Boogie" for the Coral label on July 4, 1956. The song had been written and performed much earlier, and refer to the birth of Johnny's son Rocky and Dorsey's son Billy, who were born around the same time in 1953, and were firstborns for each of the brothers. The song was part of their repertoire in 1956 when they were living in New York City and performing with Gene Vincent. It's easy to understand how the New York audience might have thought the Burnettes were singing "Rockabilly Boogie," but they never would, because the term hillbilly was derogatory and would never have been used by the artists themselves. Rocky Burnette, who later would become a rockabilly artist himself, has stated on his website that the term rockabilly derives from that song. It's also interesting, that this song has been covered by hundreds of artists in the years since, and is always called "Rockabilly Boogie". When Elvis Presley left Phillips' Sun Records and recorded " Heartbreak Hotel" for RCA, the RCA producers placed microphones at the end of a hallway to achieve a similar effect. The most notable of these bands was The Beatles. When John Lennon first met Paul McCartney, he was impressed that McCartney knew all the chords and the words to Eddie Cochran's " Twenty Flight Rock". As the band became more professional and began playing in Hamburg, they took on the "Beatle" name (inspired by Buddy Holly's Crickets ) and they adopted the black leather look of Gene Vincent. Musically, they combined Holly's melodic songwriting sensibility with the rough rock and roll sound of Vincent and Carl Perkins. When The Beatles became worldwide stars, they released versions of three different Carl Perkins songs, more than any other songwriter outside the band, except Larry Williams, who also added three songs to their discography. (Curiously, none of these three were sung by the Beatles' regular lead vocalists—"Honey Don't" (sung by Ringo) and "Everybody's Trying to be my Baby" (sung by George) from Beatles for Sale (1964) and "Matchbox" (sung by Ringo) on the Long Tall Sally EP (1964)). Robert Gordon emerged from late 1970s CBGB punk act Tuff Darts to reinvent himself as a rockabilly revival solo artist. He recorded first with 1950s guitar legend Link Wray and later with UK studio guitar veteran Chris Spedding and found borderline mainstream success. Also festering at CBGB's punk environs were The Cramps, who combined primitive and wild rockabilly sounds with lyrics inspired by old drive-in horror movies in songs like "Human Fly" and "I Was a Teenage Werewolf". Lead singer Lux Interior's energetic and unpredictable live shows attracted a fervent cult audience. Their " psychobilly" music influenced The Meteors and Reverend Horton Heat. In the early '80s, the Latin genre was born in Colombia by Marco T (Marco Tulio Sanchez), with The Gatos Montañeros. The Polecats, from North London, were originally called The Cult Heroes; they couldn't get any gigs at rockabilly clubs with a name that sounded "punk", so the original drummer Chris Hawkes came up with the name "Polecats". Tim Polecat and Boz Boorer started playing together in 1976, then hooked up with Phil Bloomberg and Chris Hawkes at the end of 1977. The Polecats played rockabilly with a punk sense of anarchy and helped revive the genre for a new generation in the early 1980s. Morrissey adopted a rockabilly style during the early 1990s, being largely influenced by his guitarists Boz Boorer and Alain Whyte and working with former Fairground Attraction bass-guitarist and songwriter Mark E. Nevin. [ citation needed] His rockabilly style was emphasised in the singles " Pregnant for the Last Time" and " Sing Your Life", as well as his second solo album and tour Kill Uncle.